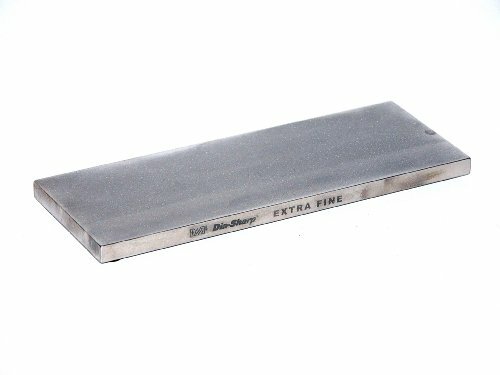 Achieve the ultimate sharp edge with DMT's Extra Fine (9 micron / 1200 mesh) D8E Dia-Sharp bench stone. As the finest grit bonded diamond abrasive bench stone available today, the D8E offers a simple and easy solution to assuring the finest performance from all tools and knives in all applications. No need to fuss with fragile, messy and high maintenance Arkansas or Water stones to attain a polished edge for your finest work. The DMT D8E Dia-Sharp precision engineered diamond surface will stay flat throughout all your sharpening requirements without hollowing, chipping or cracking. Diamond grade clearly marked on side of stone. Sharpening with diamonds is fast and easy. No messy oils needed-sharpen with soapy water. Durable construction will provide years of consistent performance and reliable service. For proper tool maintenance, woodworkers, chefs and other professionals rely on the superior quality and versatility of DMT products. Made in USA.